If you know what to look for, you don't need the likes of the NSA to detect the emotional content of what others are thinking-feeling while on their cell phones. In these two images taken a few seconds apart and from different angles, Angela Merkel speaks on her mobile - and tells us more than she believes. 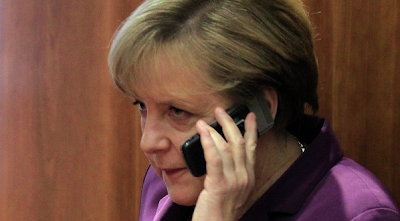 Note how the German Chancellor's pinky (aka fifth, smallest digit) finger is extended away from and not in contact with her phone. 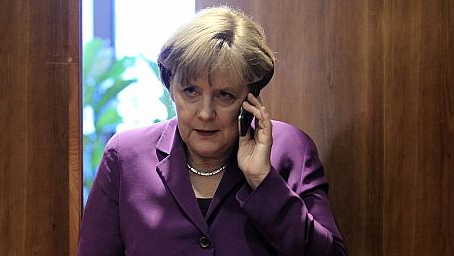 Moreover Merkel's middle finger - while touching her mobile - is gripping more loosely. This configuration a reliable nonverbal indicator that she feels in need of distancing herself from the person and/or the subject manner with whom/what she is speaking. In addition her fingers are splayed slightly more apart than is her (or most others') normal baseline when holding a phone. She feels that the person or subject matter is in some way "dirty" and she wants to minimize contact with it/them. A useful and parallel body language metaphor is brought to mind when visualizing picking up a soiled rag - we extend some our fingers apart from it, lessening our contact with what is undesirable.